These are done using two skeins of Briggs and Little pure wool knitting worsted, which, unlike most commercial wool yarns, feels like it still has some relation to a sheep. You would not want to knit your undies out of it, but it’s far warmer and stronger than those hyper-processed yarns if you’re making mittens, hats, socks, etc. It has just enough lanolin left in it so that your mittens don’t instantly turn into a soggy limp sack on your hands, if you decide to make a snowman. Cast 36 stitches onto one of a set of 3 mm mitten needles (4 double-ended needles), then transfer so there are twelve stitches each on three needles. Knit one round to get it joined up and going, then knit 2 purl 1 until cuff is long enough. Now, increase by casting on the second colour every other stitch. That is, knit one in cuff colour, cast on one of second colour, knit one cuff colour, cast on one second colour, etc. (Just cast on the stitches off your thumb; if you mess around with the fancy casting-on that involves knitting a stitch off the needle somehow, you’ll probably get into a mess.) Then knit alternating colours up to base of thumb. Put six stitches off of one needle and six off of the next onto a big safety pin for the thumb hole. Knit around, and when you get to the thumb place, cast six stitches on the end of one needle, six on the beginning of next. At tip of third finger, start knitting two together until the mitten is pretty much closed off and you can’t really do it any more. This should be the right size for your hand to fit in. Then cut your yarns, leaving long tails, use a darning needle to draw both yarns through all the remaining few stitches, and weave the ends in. Pick up your thumb stitches off the safety pin, and twelve stitches off the upper edge of the thumb hole. Go around and around until nearly to tip of thumb, then knit two together until impossible, and finish off as you did the mitten. Use the long tails where you started the thumb to weave into the gaps that are inevitable in the upper thumb seam. On one mitten, I began tapering at the baby finger, with random knittings of two together. Mistake. Note the funny shape. It only fits one hand, but they should be interchangeable until you’ve worn them a bit and set the front and back. Also the thumb sticks out oddly because I forgot to pick up the upper stitches and simply cast on twelve new ones, and then sewed the thumb on. 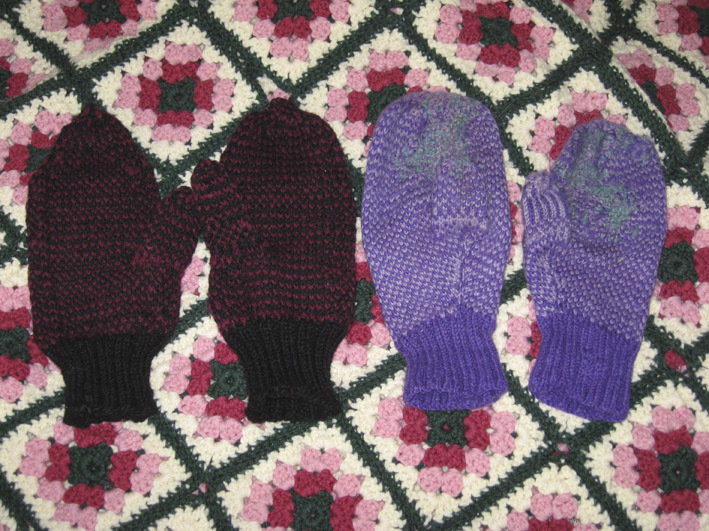 On the second mitten, I began to doubt, and again started narrowing too soon, though not as soon as the other one. Then I realized the mitten would be too short for my long hands, stopped narrowing, then started again, resulting in, er, well, a sort of curvy, abruptly pointy end. Let’s just say it looks a bit like a Russian onion dome. They should look more like my old purple ones, knit about fifteen years ago and now consisting of darns upon darns. This entry was posted in Life and tagged Briggs and Little yarn, double-knit, knitting, mittens. Bookmark the permalink. Oh, lord, I’m jealous. I tried to get my Mum to teach me how to knit once, and it all ended in laughter and a comment from her of, “What are you, retarded?” Needless to say, I wasn’t a natural back then. I’m hardly a natural yet. I knit grimly, and out of a feeling that at my age I shouldn’t expect my mother to make me mittens. (I depend on my mother-in-law for socks, though. I once asked her for the pattern, feeling guilty, but then looked at it and though, well, she likes knitting socks, why should I deprive her of the pleasure?) Crocheting is relaxing, though. Despite that, I will start the sweater. It looks a lot easier than socks, at least!